1. AC Transit bus drivers issued a strike notice yesterday, stating that they intend to walk off the job on Wednesday because of stalled contract negotiations with management, the Trib reports. The two sides are not that far apart on wages, but are at loggerheads over health-care costs and working conditions. The bus drivers say that the transit agency has cut time for lunch and bathroom breaks, and that on-the-job injuries have skyrocketed. Today is the one-year anniversary of the fire. 2. 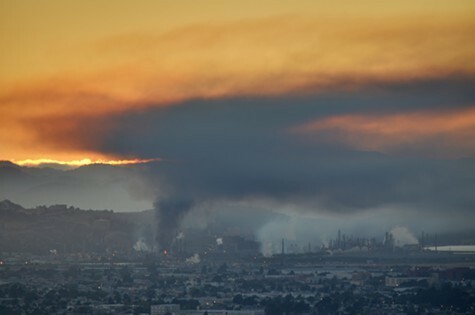 Chevron pleaded no contest in court to six criminal charges and agreed to pay a $2 million fine for the refinery fire one year ago today in Richmond that sickened 15,000 area residents, SFGate reports. The legal case against Chevron was brought by the Contra Costa District Attorney’s Office and the state attorney general. Federal authorities may also bring criminal charges against Chevron. In addition, the City of Richmond sued Chevron last week, seeking financial damages for the fire. 3. Governor Brown’s administration is proposing to transfer inmates to privately run prisons — a costly decision — rather than release offenders as part of its plan to comply with a federal court order to reduce the state’s prison population by 10,000 inmates by the end of this year, the SacBee$ reports. Corrections chief Jeffrey Beard said that releasing inmates before their sentences are completed would be too dangerous. 4. A new study concludes that the governor’s $25 billion plan to build two giant water tunnels underneath the Delta will create one million jobs and $5 billion in economic benefits to the state’s economy over the next fifty years, the SacBee$ reports. However, environmentalists quickly criticized the study, which was commissioned by the state, as being unreliable because it assumes that the tunnels will carry more water than may be legally possible. 5. And the University of California has decided to make academic research produced at all ten of its campuses freely available to the public rather than through costly academic journals, the Trib reports.